« The $1 Shawl… a sort-of Granny post. Here are a couple of tries at a different shape granny. Found this pattern among others on line and decided it was the one. Just used some regular Red Heart yarns with “I” and “G” hooks. I think I’ll probably use the large hook and start on a new afghan. I’m also testing out a 1/4 square granny log cabin block and starting another set of basic grannys. ( but with lighter and brighter colors this time) So hopefully I’ll be posting photos of some more new creations. I am really enjoying seeing what everone is doing. Ooh, now this is interesting! It’s great to see all the different kinds of ‘grannies’ we’re trying. (It’s making me almost regret that my piece is going to be so traditional!) 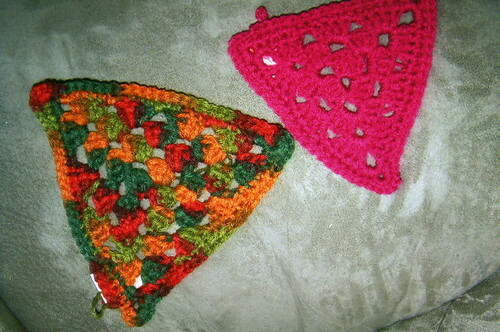 I’d love to see this triangle shape in a finished afghan. LOVE those… I totally want to do a whole bunch of those, stash-buster style, all joined by black yarn… kind of an Amish Quilt colors, if you catch my drift? Awesome. My sister wants me to make her an earth tones granny-ghan for her by her 30th birthday. (Thank heaven I have TWO YEARS to work on it!) Now that I’ve seen the triangle grannies, I’m coming up with all kinds of funky ideas for her! what a neat look……I imagine you could do lots of different thing with the triangles…now I’m going to have to go look up the pattern……..hhhhhhmmmmmmmmmmmmm. This was not my personal design. I had just found it on the web. Don’t remember where it was, but did find it on about.com. Search – about.com:crochet – and it should be the first choice – Granny Squares. Click on that and just scroll down till you see Triangle Granny Square. Click that and it should take you to the pattern. Let me know if this doesn’t work. I’ll go through my Granny patterns and find it for you. It is a fun and quick one to do.